Dr. Bieber deals with the prevention, diagnosis and treatment of acute and chronic pain and musculoskeletal disorders, such as arthritis, tendinitis, wrist, neck, mid and low back pain, shoulder, knee, hip, foot, ankle pain, stroke complications and sport and work related injuries. Electrodiagnostic procedures can be used in the diagnosis of pain, tingling, numbness, weakness, fatigue, muscle cramps and other abnormal sensations. The two procedures used most commonly are the electromyographic examination (EMG) and nerve conduction study (NCS). 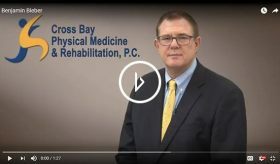 During electrodiagnostic medicine examinations at Cross Bay PMR, Dr. Bieber examines electrical activity in muscles by inserting fine electrodes into them. The electrical activity can be both observed and heard. Nerve conduction studies evaluate the presence of nerve damage by applying electrical stimulation to portions of nerves. The results of the electrodiagnostic examination will help the physician in determining what is wrong and how it can be treated.